King Design offers a low cost, winning results, no-nonsense approach to the product design and development business. They get results for individuals who want to get serious about launching their new ideas onto the market. 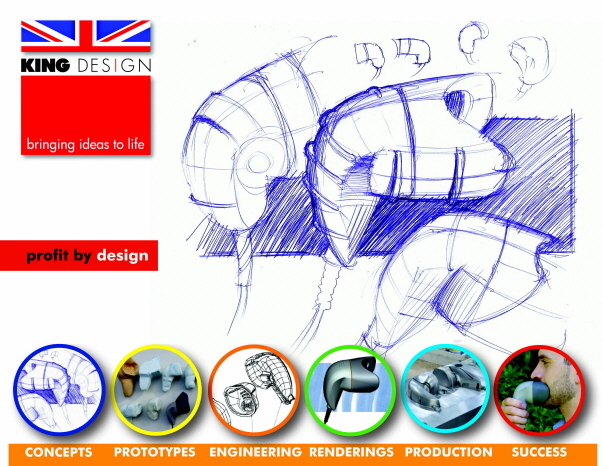 Offering a complete new product design development service – design, prototypes, production. King Design partner with and support you, developing your new product idea. With 25+ years of experience in dealing with product developers, King Design have assisted hundreds of inventors & new product developers refine their new product ideas in preparation for production. We can take your idea and deliver you a finished product. Serving clients in the UK, Canada & the United States. Covering: Product design & development, Graphic design, Packaging design, Retail design, Point of sale design, Interior design, Exhibition/Trade show design.